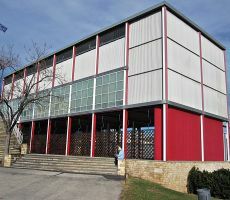 The Pavelló de la República CRAI Library is considered one of the leading archive libraries in the world on the Spanish Second Republic, the Spanish Civil War and exile, the Franco regime and Spain's transition to democracy. It also has an important collection on Sovietism and the international political history of the twentieth century, particularly the Second World War. Annual report: see the collection in the Digital Repository. The archive of the Pavelló de la República CRAI Library is comprised of collections from the Centre for International Historical Studies (CEHI), the Figueras Foundation and, since 1996, material incorporated through the CRAI. This includes original documents transferred to the Pavelló de la República CRAI Library by political parties, labour organizations and unions, institutions and private individuals. The archive can be consulted using our inventories and a local database. All the inventories can be found at the UB Digital Repository or at the University of Barcelona's Library Catalog. The Pavelló de la República CRAI Library is housed in a replica of the Pavelló de la República building that was constructed for the 1937 World Exhibition in Paris and destroyed after the event. On the event of the Olympic Games in 1992, Barcelona City Council commissioned the architects Antoni Ubach, Miquel Espinet and Juan Miguel Hernández León to create the replica. In 1994, Barcelona City Council ceded this emblematic building to the University of Barcelona. A reproduction of Picasso's Guernica can be found on a wall in the pavilion's open courtyard, in the same place as the painting's original location.